Who loves butternut squash? I do!! 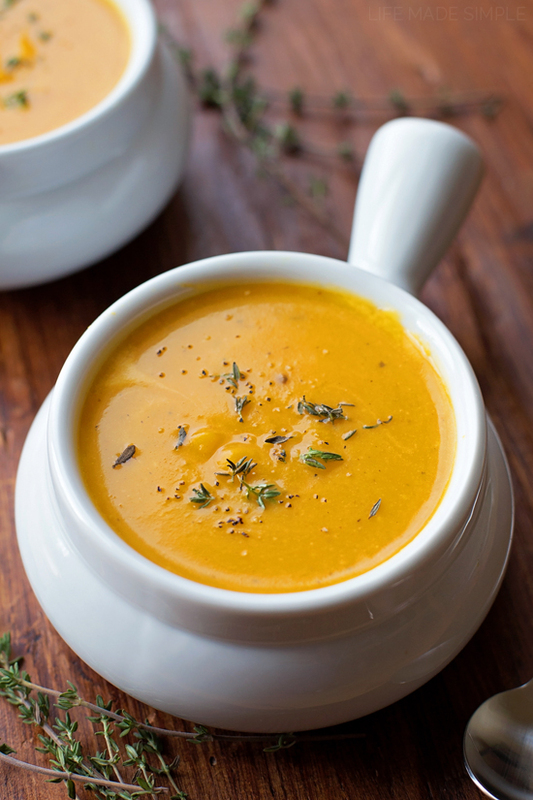 I’ve been on a soup kick lately and I couldn’t help but roast some butternut squash and toss it in this crazy flavorful soup! 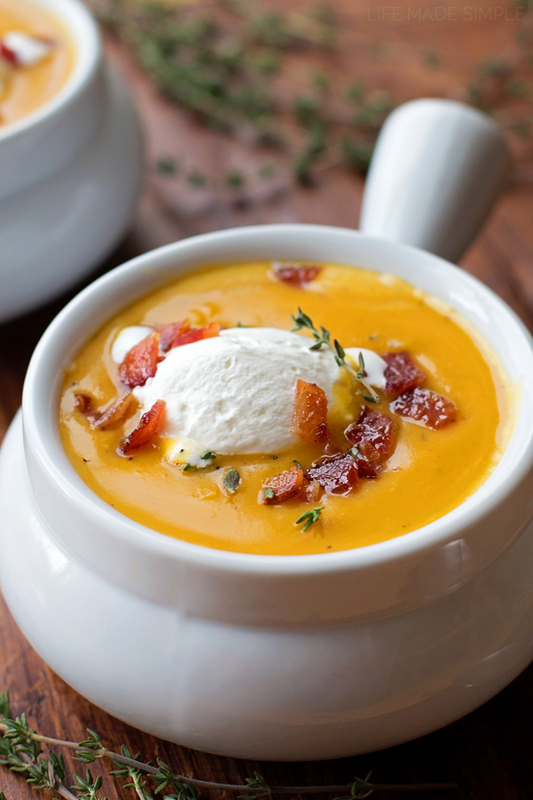 It’s silky smooth and topped with a dollop of whipped cream and chunks of candied bacon. Fall has never tasted so good! Guys, it’s been a while since I’ve made butternut squash soup. There’s definitely a reason behind that too. Like I’ve mentioned before, my husband isn’t a huge fan of pumpkin or squash, so I have to get really tricky or inventive when I cook with it. It’s got to be really flavorful and tender. That’s where those gorgeous little gold nuggets below come in. I decided that if I was going to make this soup it’d better be darn good (and believe me, it was)! I cubed my squash, tossed it in some olive oil and spices and roasted it, along with some onion and garlic to perfection. I knew those crispy bits would be what sold him… oh yeah, and the candied bacon! After roasting the veggies I threw them in my Dutch oven along with some chicken broth, grated apple (for sweetness), fresh ginger and thyme. While that simmered I broke out the bacon, brushed it with the most amazing maple-Dijon glaze, and baked it to crispy perfection. 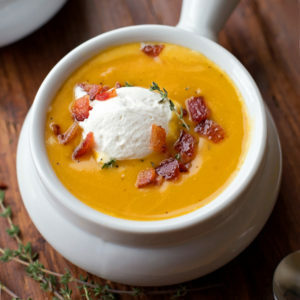 I used my immersion blender to puree the soup so that it was silky smooth, topped it with a dollop of homemade whipped cream, then garnished it with lots of candied bacon and a few sprigs of thyme. My husband loved it! We both licked our bowls clean. I cannot wait to make this again!!! If you’re on the hunt for a cozy, flavorful soup, I hope you’ll give this one a try! It’s got the perfect balance of earthy, sweet and salty. Enjoy & happy fall! 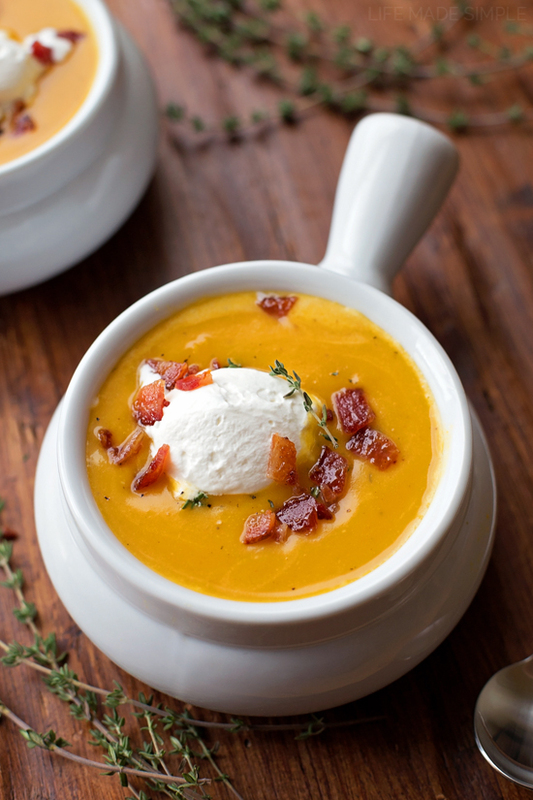 This silky roasted butternut squash soup with maple candied bacon is perfect for fall! It's warm, cozy and bursting with flavor! cubed butternut squash, diced onion and garlic in the olive oil, paprika, cayenne, pepper, and salt. 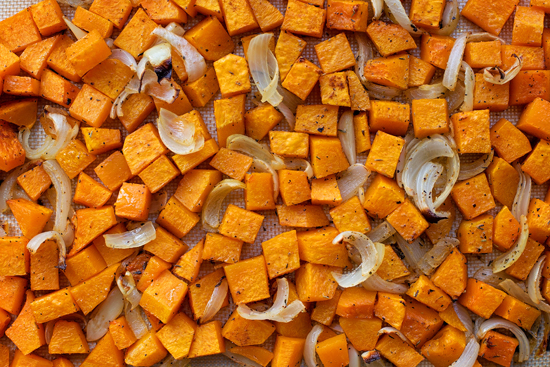 Place in the oven and roast until the squash is tender, about 20-25 minutes. Meanwhile, to make the candied bacon, line a baking sheet with aluminum foil and top with a wire rack. In a small mixing bowl whisk together the syrup, brown sugar, mustard, salt, and cayenne pepper. 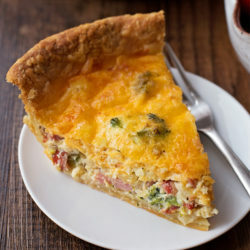 Place slices of bacon on top and brush each side with the mixture. Reduce oven temperature to 350 degrees and bake until crisp and brown (but not burnt), about 30 minutes. Remove from the oven and allow to cool for 5 minutes before removing from the wire rack. Chop into chunks, set aside. In a large dutch oven or stock pot over medium heat add the apple and chicken broth. Bring to a simmer, then add the roasted vegetables along with the ginger and thyme. Cook for 10-15 minutes, then remove from the heat and immersion blend until silky smooth (use a blender and do it in 2-3 batches). Garnish with chopped candied bacon and a dollop of whipped cream. -Don't skip the candied bacon! 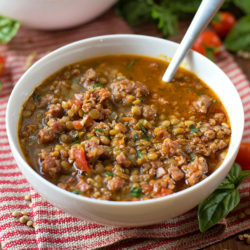 It adds a ton of flavor to this soup and really balances everything out... I promise it's worth it. P.S. 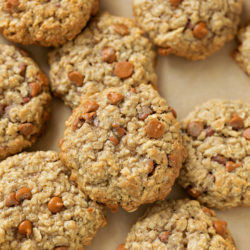 you can totally double the recipe and snack on the leftovers! So, just so I understand correctly, first I roast the squash, then it gets cubed, then roasted again?